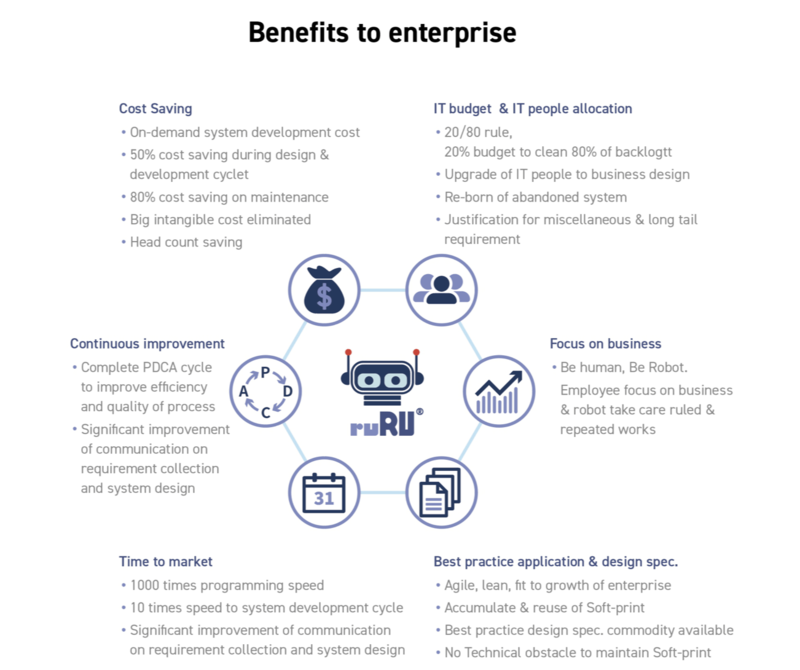 50% cost saving during design &development cycle. 80% cost saving on maintenance. 20/80 rule, 20% of IT budget to clean 80% backlog. Justification for miscellaneous & long tail requirements. Complete management PDCA cycle to improve efficiency and quality process . Employee focus on business & robot takes care of ruled and repetitive works. 1000 times of programming speed. 10 times of speed to system development cycle. Significant improvement of communication on requirement collection and system design. Best practice application & design spec. Agile, lean, fit to growth of enterprise software. Accumulate & reuse of soft-print. Best practice design spec commodity available.